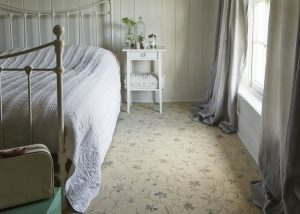 If you are looking to upgrade the flooring in your bedroom spaces the typical choice for many decades has been carpet. Still a perfectly sound choice there is a lot to be said for the soft feel of carpet underfoot in these more relaxing spaces in the house, which are also less likely to suffer the high traffic of muddy feet and family dinner times. However, one thing today’s modern flooring offers is choice. 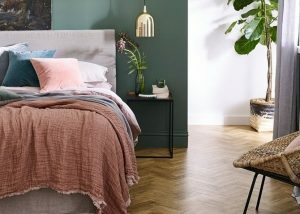 Whether that is still carpet – the amount of styles, materials and finishes is now endless – but hard floor options are also now a welcome addition to bedroom spaces. 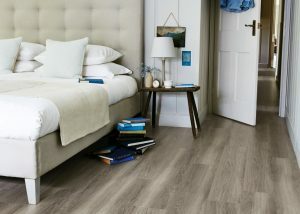 Options such as luxury vinyl offer a plethora of creative styles and bespoke design options, or engineered wood flooring adds a truly natural feel introducing calming real wood surfaces into your sleeping space. Your choice may also come down to who uses the bedroom. 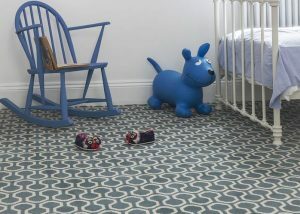 LVT can offer a really practical solution for children’s bedrooms being extremely durable, stain resistant and with a softer feel than some hard wood floors. 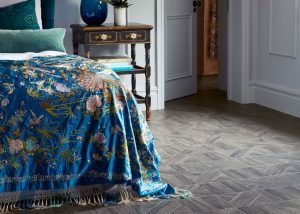 Or the beauty of real wood floors will create a long lasting natural backdrop, which is easy to keep clean – and you can give your bedroom a quick and easy face lift with new bedding, soft furnishings and a coordinating rug every few years. 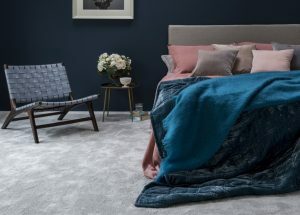 Back to carpet and there are some seriously luxurious options which offer a lush, deep pile feel under foot for ultimate cosiness. A lovely option for the grown up master bedroom where spillages are less likely. 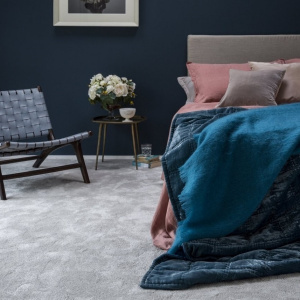 Or if you want to have the same uniform look throughout the upstairs spaces, a neutral wool loop carpet is durable and has the advantage of allowing each bedroom to have its only unique interior design, providing a backdrop that will work with any colour. 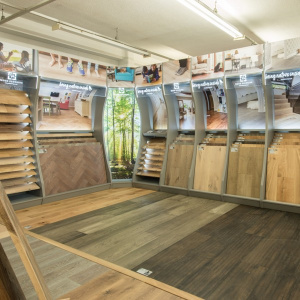 At Vincent Flooring we have an endless choice of carpets, luxury vinyl, laminate and real wood floor choices. And your pick of hundreds of rugs for the finishing touch. Here are just a few bedroom floor style ideas to inspire your flooring upgrade. Shop hundreds more in our Walton-on-Thames carpet and flooring showroom. And why stop at floors; if a new bed is part of your home improvement plans you’ll find our bed centre on the first floor which has a fantastic range of beds and mattresses to try from some of the leading bed brands. Cormar Carpets Sensations range delivers the ultimate luxurious soft pile under foot. 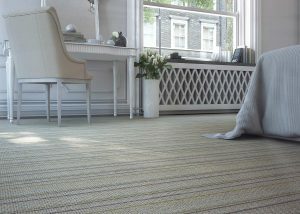 Or add interest to a neutral wool loop carpet introducing soft stripes like the Henley Brazil. Want to keep a country classic look? Try Brintons Parterre Champagne for a gentle floral infusion. 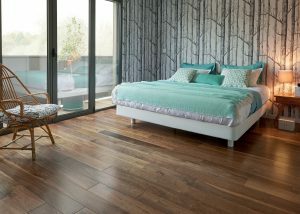 Or the geometrics of Alternative Flooring Quirky B Honeycomb will give a modern twist to your bedroom space. Light greys deliver tranquillity in abundance. 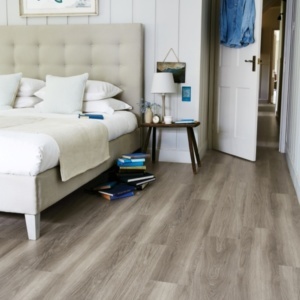 V4 Wood Flooring’s Eiger Petit Grey is a lovely oak option. Or go for more traditional oak tones with something like Panaget’s Noyer Otello french oak floors. Luxury vinyl wood effect floors are a great choice with many available in herringbone or plank styles. Here Amtico Form in Rural Oak herringbone and Amtico Spacia in Nordic Oak plank give real wood style with practical LVT benefits. 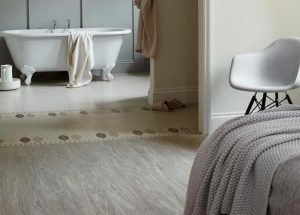 Create harmony with your en-suite by mixing LVT wood in the bedroom and stone in the bathroom, adding a border for extra design flair. Or a laying pattern like pleat in Amtico’s Quill Guesso will add eastern elegance to your bedroom design. 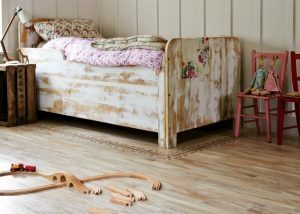 An ideal choice for children’s bedrooms here Karndean’s Tiger Wood gives a classic finish, while Amtico Signature in Lime Wash Wood with feature border creates a design flair your child will never grow out of. Inspired? Pay us a visit and start planning your perfect bedroom floors. We offer a full supply, fit and aftercare service. Find us.